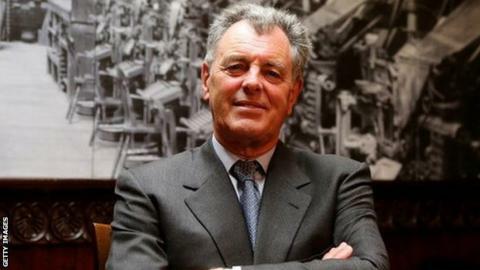 Eight months on, Bernard Gallacher's recovery from a cardiac arrest and five days in an induced coma still seems like a minor miracle. I can testify to this personally, having just spent time with the great man. "I was as good as dead," is sometimes a trite, even flippant phrase, but not in Gallacher's case. The three-time Ryder Cup captain was all but given up by the golfing community when he was in intensive care in an Aberdeen hospital last year. To be frank, the newspaper obituaries were already being prepared. I thought about this when I met a bright, glowing, healthy-looking Gallacher this week, to conduct my interview with him for BBC Radio Scotland's Golf Show (to be broadcast on Sunday 27 April, 1030 BST). Gallacher has always looked a healthy spud with his boyish twinkle, but here he was in front of me, positively beaming with apparent good health. When we met I wanted to talk to him not only about his very obvious health scare, but also about his long and extremely colourful career in golf. Because that in itself is a great story. It's often forgotten today that the young Bernard Gallacher, scarcely out of his teens in west Lothian, became the number one ranked golfer in Britain. Back in those early 1970s days, when the European Tour wasn't yet an organised, corporate body, he found himself traipsing around Africa and elsewhere, playing tournament golf and picking up a cheque wherever one was available. It's funny now, looking back and seeing that Gallacher won the Kwacha Eagle Open of Zambia in 1969, to wonder what kind of life it was for him back then. He trundled across Zambia and - as it was then - Rhodesia and elsewhere in a car, with his clubs in the boot. It was a vagabond existence for a 21-year-old. In fact, 1969 was Gallacher's breakthrough year - he won four events in Europe and Africa - and it didn't go unnoticed. At Augusta National, the Masters organising committee always liked to have an international field, had spotted the doings of this erstwhile unheard-of young Scot and invited Gallacher to play in the 1970s Masters - to date his only one. "The Masters then wasn't like it is today," Gallacher told me. "I arrived just the day before the event to play in it." He duly shot rounds of 77 and 74 before missing the cut - but a very fine golf career lay ahead of him. A stream of European Tour and wider tournament wins would follow, on top of eight Ryder Cup appearances as a player, before Gallacher was nominated Ryder Cup captain for the 1991 matches - the first of three stints in the role. Having lost narrowly twice, the heat was well and truly on him to go and win it at the third attempt, which he did in dramatic fashion at Oak Hill in 1995. There's much to this Bathgate man, now scion of the Gallacher dynasty in sport, which appeals and attracts. His life, however, might well have been cruelly cut short, aged 64, last autumn. It has been good to see him revived and well once again. The Golf Show, presented by Graham Spiers, airs every Sunday morning on BBC Radio Scotland at 1030 GMT.